For an SSD or hard drive benchmark and test utility that really puts drives through their paces, they don’t come much more comprehensive than Anvil’s Storage Utilities. While being able to perform a complete read and write test using sequential and random operations, it displays a full set of results including response time, speed in MB/s and also IOPS. A total overall score is in the yellow box. Also included are 3 extra IOPS tests, an endurance testing function and the ability in the settings to alter the amount of compression to use on the test file. More functions like a system information tab and a screenshot saver round off an impressive tool. Anvil’s Storage Utilities is not a final build yet and currently at the Release Candidate stage. DiskTT is a small and portable testing tool that uses Windows core read and write functions to write a temporary file to the specified drive, then read it back sequentially and randomly to get three resulting scores. 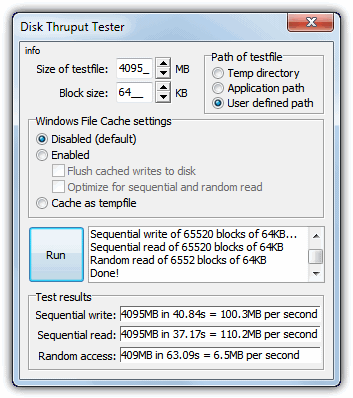 The test file can be between 10MB and 100GB with a block size to test of 1KB up to 8MB. To test a different drive to C, change the path of the test file to “User defined path” and select a drive letter. Windows file caching settings are available as an option but will often skew the results if not set correctly, so are best left alone unless you have a specific reason. Roadkil makes a number of small and useful utilities, Disk Speed is another one that simply does the job you expect with no frills or bloat (it’s only ~90KB). The program is simple to run, just select the logical drive letter or physical drive number and press the Begin button. It only runs read tests but you will get a range of scores from 512 byte blocks up to 1MB blocks for both random reads and linear reads for each block size. The “Results in Brief” box will show the average access time, maximum read speed, cached speed (also known as burst speed) and an overall score which can be compared online at Roadkil’s website with the same or similar model drives. 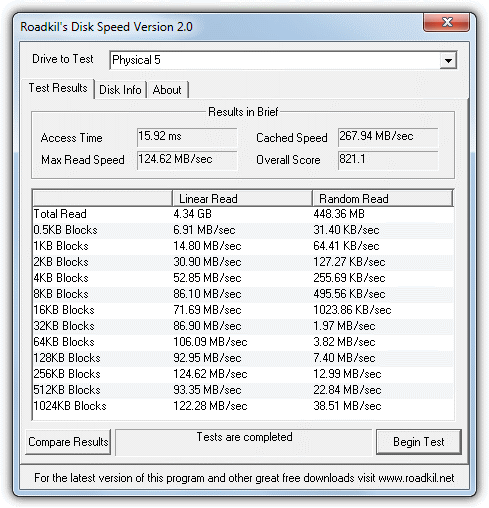 Like Roadkil’s tool, HD Speed is small and portable and around 90KB, but has more configuration options to suit different storage devices. It also has Read+Write and Read+Write+Verify modes, but be aware the data on any device you want to write test WILL be destroyed. Something useful not found on other testing tools is the option to test a specific position on the drive, 0% for the faster outer part of a hard drive, 100% for the slower inner. To run a benchmark and get the average speed on the graph, choose the drive, enter the time to run it in the box and press Start. Block size can be left at Auto or changed from 1KB up to 16MB, a log file can also be created to review the results. DiskMark is a nice tool to run because it displays plenty of information about average, minimum, maximum and last read and write scores, laid out in both raw number format and a live graph. The one slight problem with the program is actually configuring the test to perform. You can obviously leave it at the default of 64KB blocks, in an 8MB test file which runs 320 times. But to get another score such as using 1MB or maybe 4KB blocks, you have to enter the Set Size (block size), then enter the Rounds (number of blocks to make up the test file), and then choose the number of times the test file is read and written to. Incorrect setup will either produce a very short test which is less accurate or a test which takes far too long. Separate 32-bit and 64-bit versions are available. Sequential (also seq or linear) – This is the speed at which a drive can read or write continuous blocks of data in the form of large files. It’s better for data drives or games partitions to have a higher sequential speed where most files will be at least a Megabyte in size. Sequential tests will show the maximum possible read and write speeds a drive can achieve. 4K – The 4K results produced by benchmark tools show how fast a drive is at accessing small files, and are the most important scores for a Windows boot drive. Most notably the random 4K read and write speeds show how quickly the files are accessed when scattered across a partition, like in Windows. Higher 4K results will also produce a better and smoother Windows during multitasking. When looking at buying an SSD drive to install Windows on for example, study the 4K scores first and not the headline grabbing sequential speeds. HD Tach cannot run on my Windows 7 64bit system, it says that only could be run on Win2K or WinXP. Read the article again and you will see that it does work and what you need to do to get it to work. 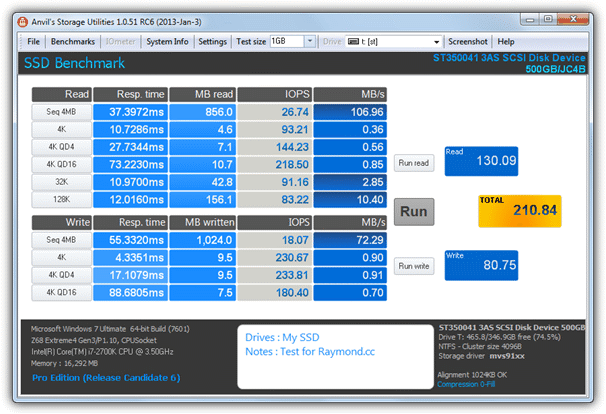 I’ve written a simplistic tool in Python to benchmark HDDs and SSDs. It is completely open-source and now in alpha stage, though you already could use it, and if interested, participate in development. CrystalDiskMark installs a hidden program on your computer that forces your browser to use a particular search engine. That’s because you are downloading the version with ads, get the one without ads to not have it install opencandy adware. So how do you know which version your are downloading? With or without ads? In fact, there is no version with ads any more, the author removed opencandy earlier in 2016. You should never run de-frag programs on a SSD, ever. Yes and no. Defrag on a HDD, from Win 7+, it run Optimize, which is the trim command. This is very important. Why? simple. An HDD is seperate into block and then into pages. It can only do 3 operations on block: Read, Write and Erase. It cannot overwrite like a hard disk. But it function the same way: When you delete something, it marks the pages related to these data as available, but not empty. A problem though, on page, it can only do Read and Write, not erase. When you have to erase a page because you run out of empty page, the ssd controller must copy all the good page in cache from the block (Read action + write action in the SSD cache), erase the block so all pages are empty and write back the good page from the cache. 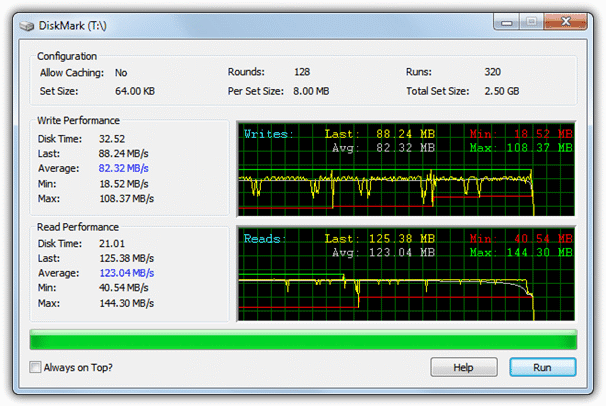 This operation take time and this is way your SSD speed degrate with usage. Thus, in the early days of SSD, Trim appeared to fix this problem. When Trim is run, it does the operation above on all needed block and pages, thus leaving the SSD only with good and empty pages. This process does add some wear on the drive, but very little. With time, OS and controller have implemented various way to bypass this problem, like doing the trim action on each erase, never leaving bad pages. I did not see Hard Disk Sentential among your programs. I’ve been using it for years now. 3 years back it told me the bad sectors of the 750GB hard disk in my Dell 545 Inspiron had increased and its performance had dropped to 80%. The system was still under warranty so I contacted Dell. After a lengthy phone call discussing the problem, they a sent a technician out. After 90 minutes, he agreed the drive was problematic, and gave me a 1TB replacement drive. I installed the new drive, made it the boot and moved everything important over to it. I made the 750GB drive a secondary just to see how long it might last. About one week later it failed. I am sure those programs you list are great but I am thankful Hard Disk Sentential was recommended to me and have it on all of our computers. 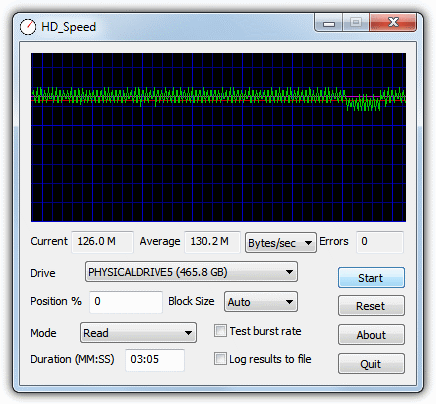 Hard Disk Sentinel is a completely different type of software and is not a tool specifically for bench marking your drives. Besides, it isn’t even free and this article is specifically about free software for the job. Installed HD Tach on Win 8. It will not run and displays a message that it will only run 2000 or XP. Go to the Simpli Software program files folder and run the hdtach.exe in Windows XP compatibility mode, works fine then. Has anyone considered whether or not a fragmented disk would effect the results?